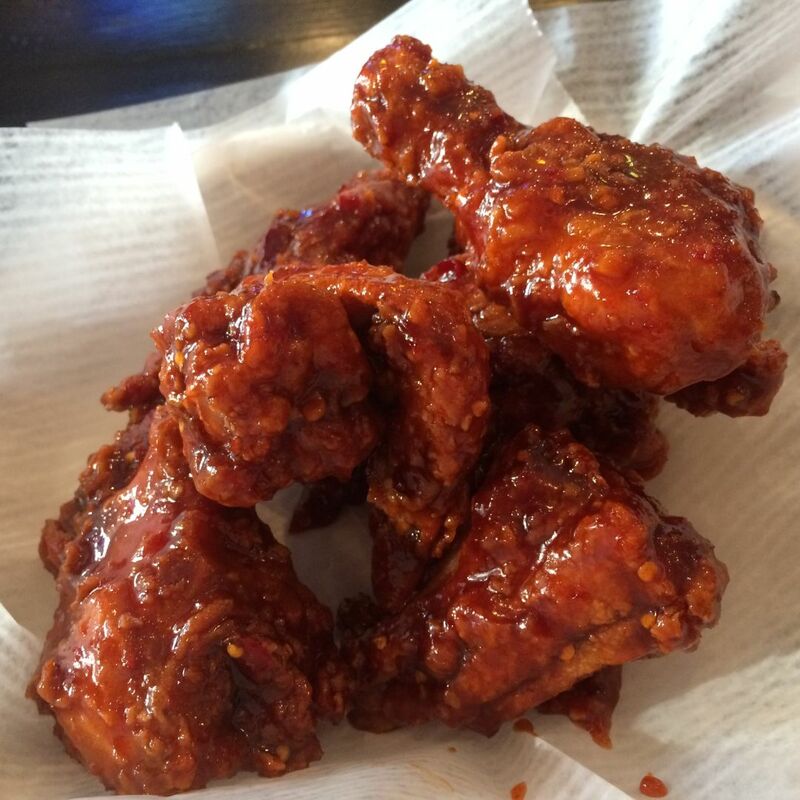 Korean chain Bonchon Chicken is slated to open in Katy next month, but until then, locals can get a double fix of Korean goodness in a single building in the same suburb: 1645 Winding Hollow Drive. 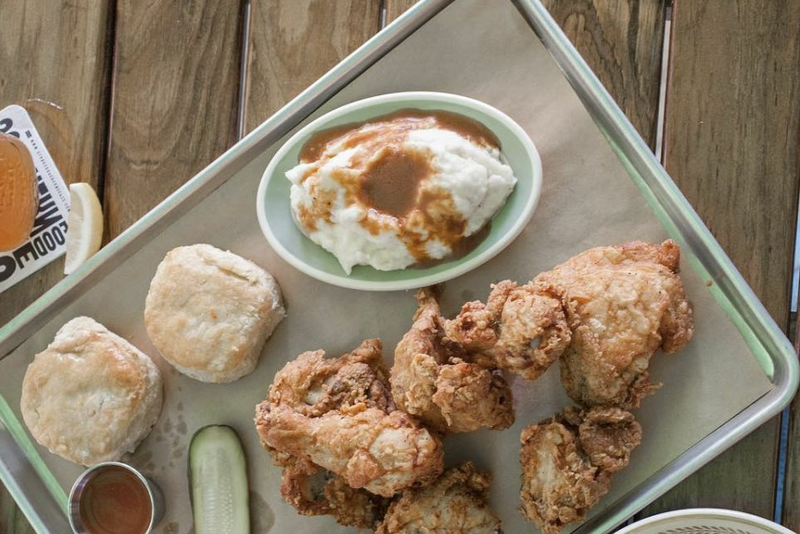 There, fried chicken restaurant Hoodadak and dessert purveyor Cocohodo are separated only by a foot reflexology business. Walking over for a sweet treat after dinner was obvious to me and to several folks who dined near me on Saturday night. 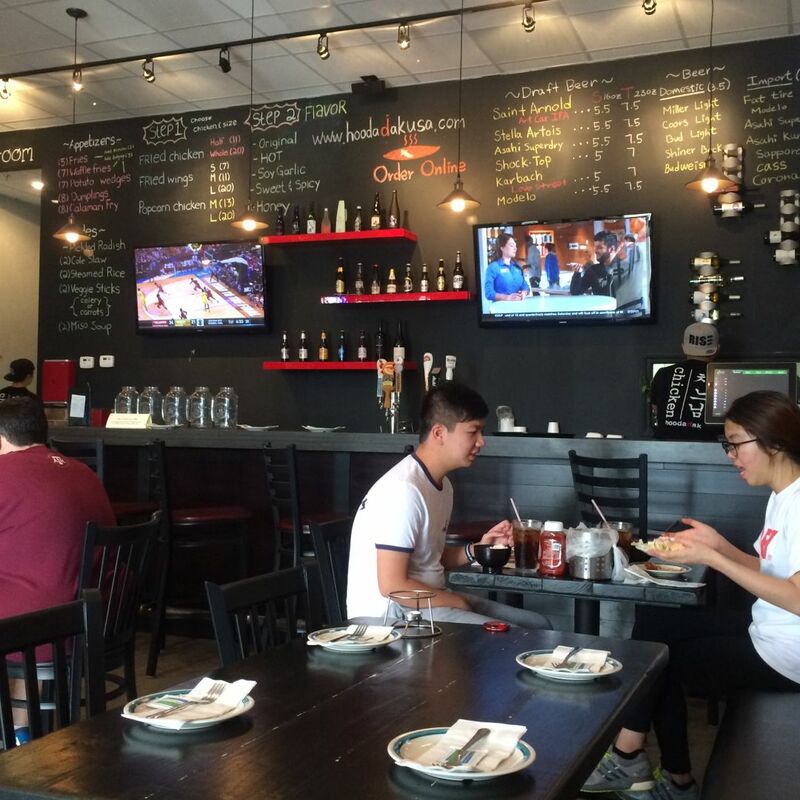 Hoodadak opened just before Christmas with a small menu and no beer-and-wine license. When the pub-style restaurant finally gained one in February, its life as the biru and soju destination it should always have been was finally cemented. Those brews are a mix of local, national and Asian companies, served in Mason-style jars. 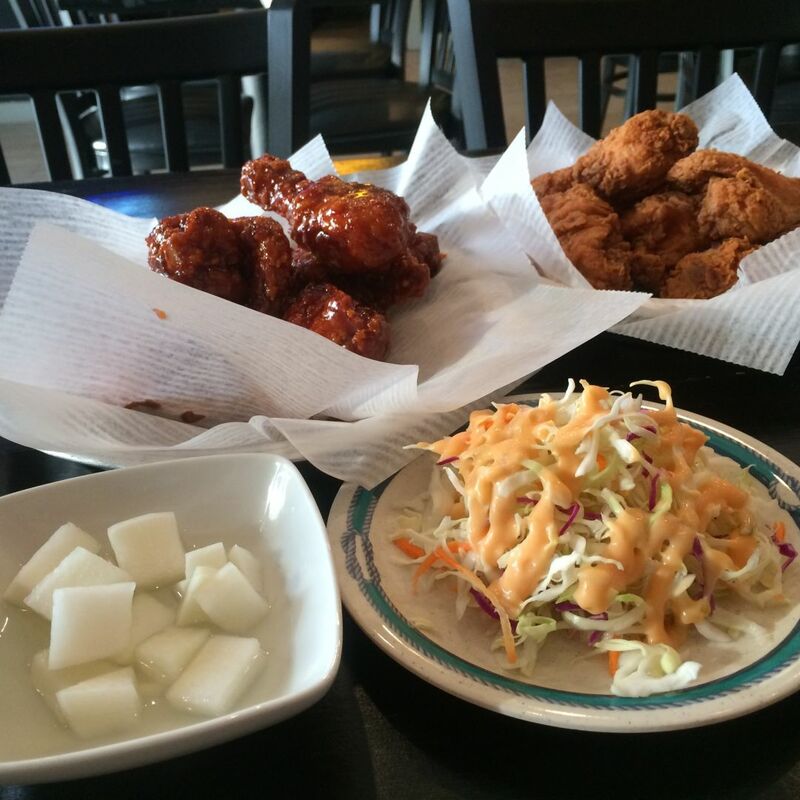 But a Korean pub is nothing without crispy, double-fried chicken. As is the case with many KFC (Korean fried chicken) spots, diners are required to order a whole chicken if they want to sample more than one preparation. So I, dining alone, ended up with the table below. Everything that comes with the $20, full chicken meal. I didn't have a choice, really. 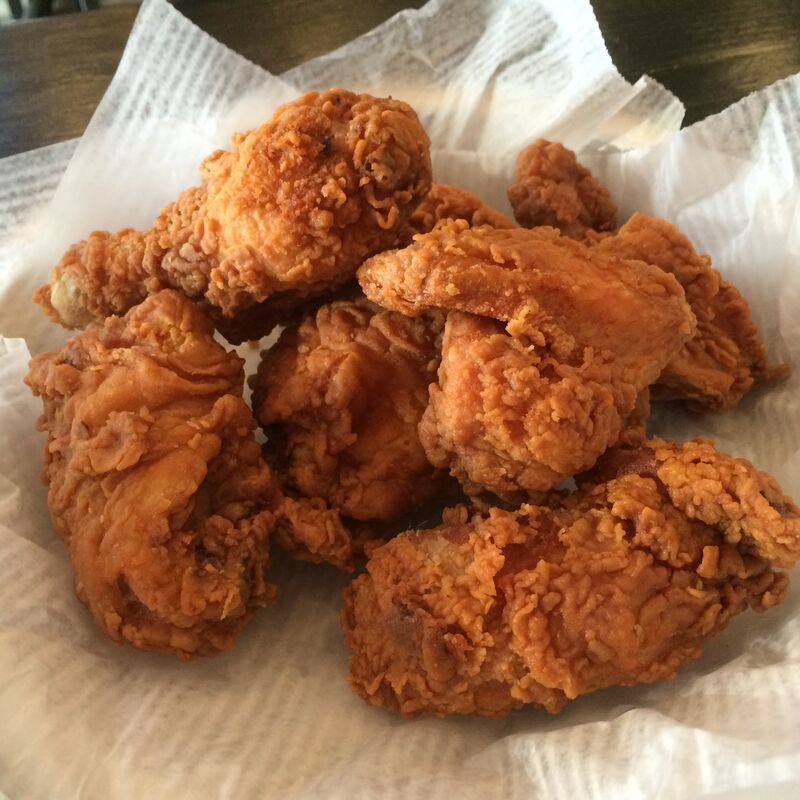 In order to appraise a KFC place, it's necessary to try both plain fried chicken and a spicy version. The soy-garlic sauce is of tertiary importance, so I'l have to save that for next time, when I also order the hot, un-sauced chicken. Without the spice of the latter preparation, the plain chicken was on the bland side, lacking the spicy brine of my favorite KFC spots. Usually, I expect my mouth to be an inferno after biting into a deep-red sauced piece of Korean chicken. 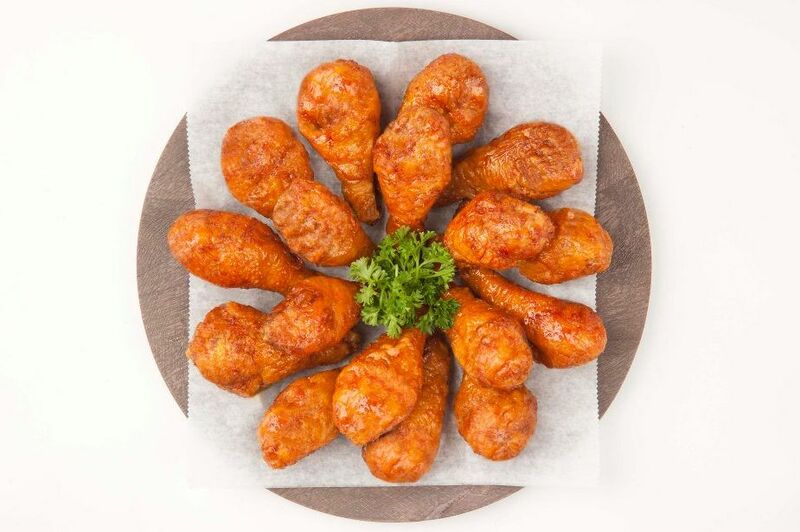 My first taste of Korean chain Kyochon's hot-and-sweet sauce years ago may have caused permanent nerve damage. 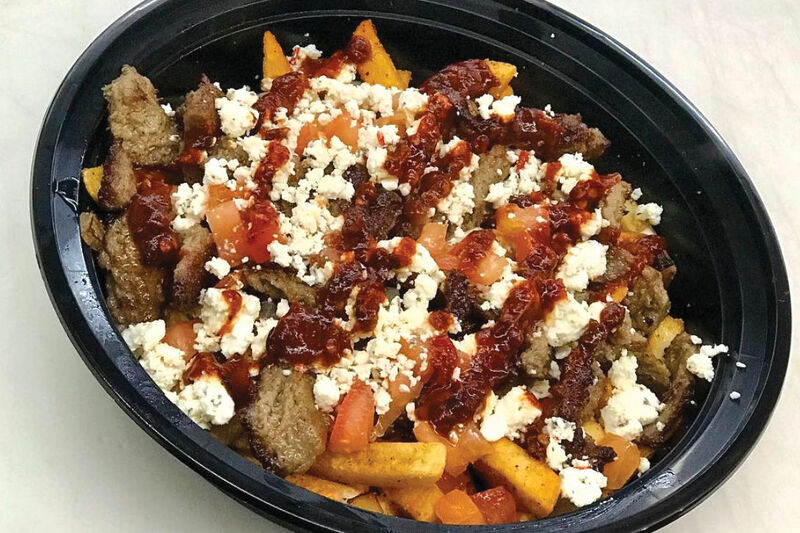 Hoodadak's is comparatively mild, with just a pleasant whisper of heat and smooth sweetness. To some that might be disappointing, but even to this gochujang-on-everything gal, it was comforting, not too messy and held fast to the profoundly crisp flesh. The salad of slaw with squiggles of Russian dressing on top was kind of a bummer, but not unexpected. I was more focused on the refreshing pickled daikon, anyway. Part of me was tempted to order a bulgogi burger, actually just marinated meat on a burger bun, or fries topped with bulgogi and kimchi. But I had eating to do elsewhere. 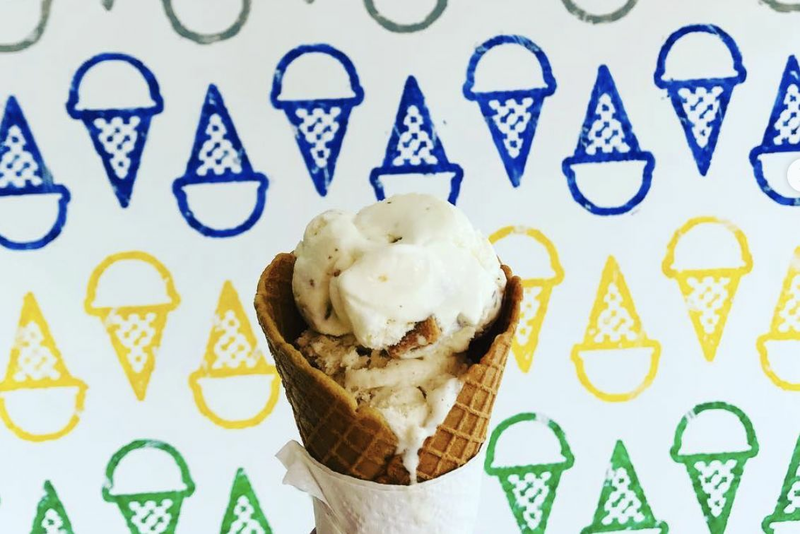 Cocohodo, alternately called Sweet Vivian's Ice Cream & Dessert Lab, takes its name from Korean walnut pastries called hodo gwaja. 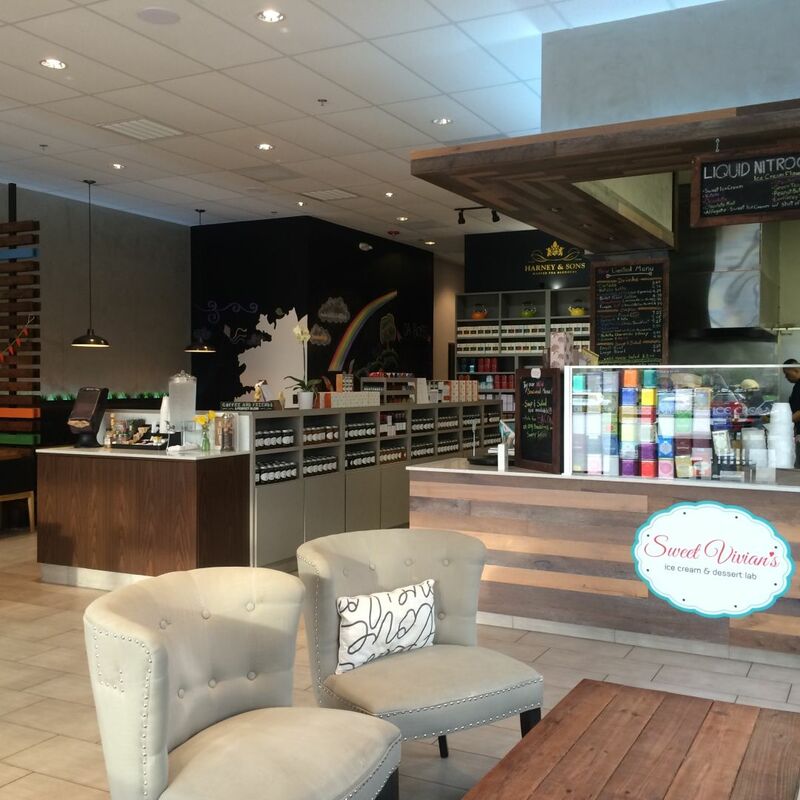 Those are the centerpiece of the business that also deals in coffee and tea (it stocks a huge selection of Harney & Sons Fine Teas), sweet and savory crêpes, iced drinks and liquid nitrogen ice cream. I initially didn't see any hodo gwaja at the counter. 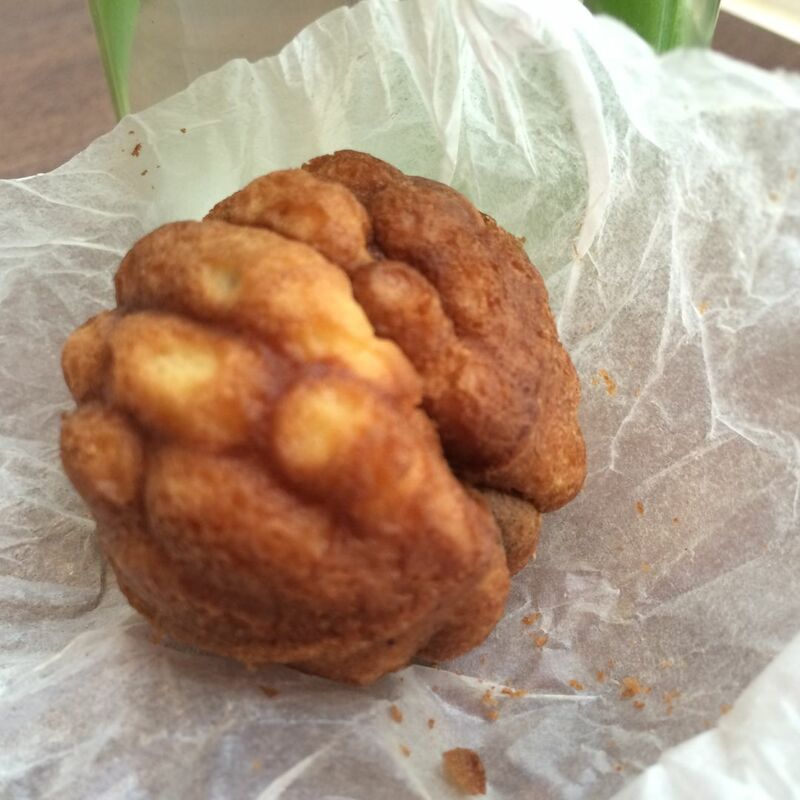 When I inquired, the young barista offered me a single, individually wrapped pastry for free. I also ordered a cup of mint-chocolate ice cream. I went to find a table, then capture the process, but seconds after I turned around, the liquid had already transformed into two soft balls of ice cream. Chocolate mint ice cream, $4.99. 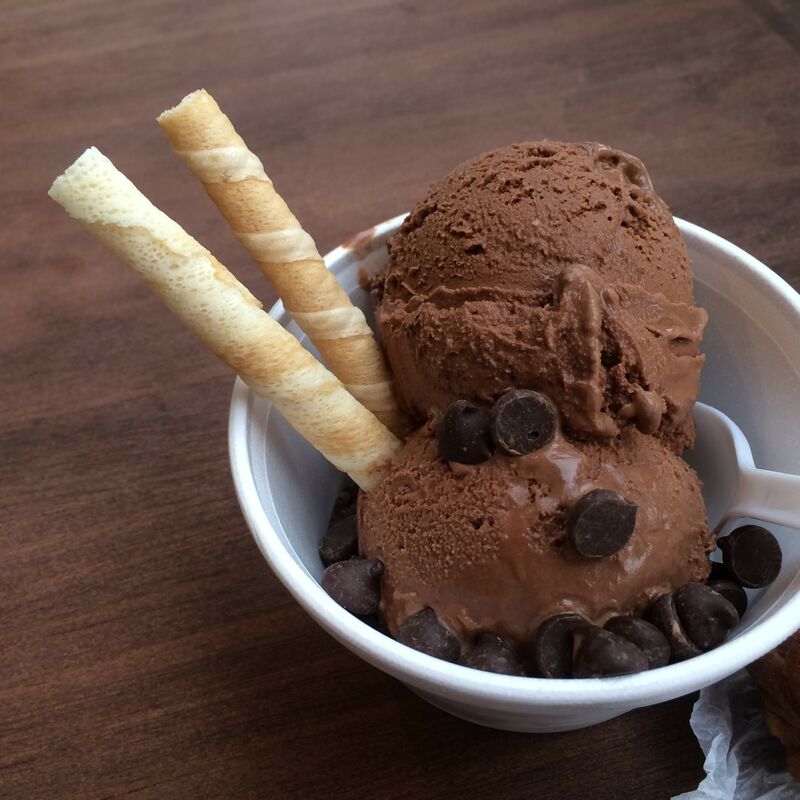 The advantage of liquid nitrogen ice cream, other than the breakneck speed of its preparation, is that there's no time for ice crystals to form and make the result feel like anything but frozen silk. And I enjoyed the flavor, too, a deep chocolate base with just a hint of invigorating mint. As for my first hodo gwaja, I was a bit underwhelmed by the warm but slightly dry cake surrounding a piece of walnut and some red bean paste. But paired with some fried chicken, it was a fun evening trip to Korea, via Katy.